This week and next, government representatives attend UN talks in Bonn looking for the next step forward on climate change. In The Green Room this week, Aubrey Meyer argues that the effective and fair model they need already exists. 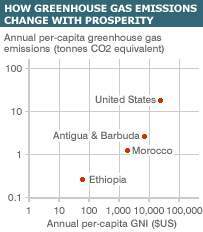 The impact of climate change, it is generally agreed, will land hardest on the poor. So perhaps it is time to listen to what people from the poorest continent, Africa, are asking for. At the climate negotiations in Bonn this week, the Africa Group of Nations has called for the adoption of a concept called Contraction and Convergence - C&C, in the jargon. They first made their call a decade ago. 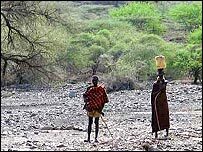 And with 12 million Africans currently facing drought and famine linked to climate, they have good reason to assert that C&C is right, that it is urgently needed, and ask: "For how long must Africa suffer at the hands of others?" Contraction and Convergence is the only long-term framework for regulating greenhouse gas (GHG) emissions which does not make carbon dioxide production a luxury that only rich nations can afford. It creates the social equity which Africa needs, and the carbon reductions which are in all our interests. Contraction and Convergence is a straightforward model for an international agreement on greenhouse gas emissions. It sets a safe and stable target for concentrations of greenhouse gases in the atmosphere, and a date by which those concentrations should be achieved, based on the best scientific evidence. The atmosphere being a "global good", C&C declares that all citizens of the Earth have an equal right in principle to emit, and will actually be given an equal right by this future date, the individual allowance for each citizen being derived from the "safe" global target. So from the grossly inequitable situation we have now, per capita emissions from each country will "converge" at a far more equitable level in the future; while the global total of emissions will "contract". That is C&C in a nutshell. Here is a numeric example based on current assessment of the danger. A maximum, or "ceiling", of 450 parts per million (ppm) atmospheric CO2-equivalent is set, giving rise to a future global emissions "budget" that contracts year-on-year to near zero by around 2080, to keep concentrations within that "safe" ppm ceiling. The tradeable shares in this future budget are agreed as "one person, one share" globally, but moderated by a convergence to the global average of equal per capita shares over, say, 20 or 30 years as a compromise to ease the transition. The constitutional logic of C&C is unarguable; there are no grounds for defending unequal use of the atmosphere. The economics are impeccable. C&C secures survival by correcting both fatal poverty and fatal climate change in the same arrangement. So far, GHG emissions have been a close proxy for wealth. Per capita emissions in rich countries are now way above the global average, let alone a sustainable average; and in poor countries, way below. Africans in particular have good reason to complain about this, as in no sense are they the authors of their misfortunes at the hands of global climate change. Greenhouse gas emissions from industrial development in the West have been accumulating in the atmosphere for 200 years, and still today Africa's accumulated emissions are a fraction of the total produced by a country such as Britain. The global account so far shows that 33% of people have 94% of the global dollar income and account for 90% of the global historical total of greenhouse gas emissions, while the other 66% of people have 6% of global dollar income and a history of emissions totalling 10%. The ratio of poor to rich life value in all this is worse than 15 to one. The rising climate-related mortality has led UK MPs to observe that this asymmetry, if uncorrected, becomes the economics of genocide. Contraction and Convergence corrects all this. Shares created by C&C are valuable because they are tradeable. A C&C agreement makes it possible for poor countries to finance their future defence against climate change and their "clean development", by trading their considerable excess emission shares to rich countries. The rich countries would use their capital to retire their "dirty development", and put in place economies that are clean and geared to reduced consumption. This is a "framework-based-market"; and organised this way, the trade marries poetic justice and economic efficiency into a plan which the British magazine New Statesman described this week as a "compelling logic that could, without exaggeration, literally save the world". In Britain, five of the seven political parties support C&C, as does more than half the total number of MPs. There is a Private Members' Bill that seeks to put C&C on the statute book. Internationally, the list of eminent individuals and institutions supporting C&C is already large and growing fast; and then there is the UN itself. 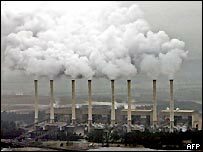 Most governments of the world have been bound since 1992, when they signed the UN Framework Convention on Climate Change (UNFCCC), to "avoid dangerous climate change" - to stabilise the rising concentrations of greenhouse gases in the atmosphere below a "dangerous" value. The Kyoto Protocol was the first attempt at finding a mechanism to curb emissions from the industrialised world, emerging as an alternative to C&C. It is now seen as completely inadequate. The UNFCCC executive has said since 2003 that "C&C is inevitably required to achieve its objective". Was it this, and a keen sense of justice for Africa, that caused the Archbishop of Canterbury to observe: "Anyone who thinks that C&C is Utopian simply hasn't looked honestly at the alternatives"? Will governments represented at the Bonn talks this week look at the alternatives and reach, finally, for C&C? Now that the leading lights of the British government and the anti-poverty movement such as Tony Blair, Gordon Brown and Bono have bonded so publicly with Africa on climate change and poverty, and declared that its voice must be heard, perhaps Africa's call for C&C will at last be listened to. It is the international agreement they seek, and that we all need to survive. Aubrey Meyer is director of the Global Commons Institute (GCI), an independent group concerned with the protection of the global commons. The Green Room is a series of opinion pieces on environmental issues running weekly on the BBC news website.